Jodie is a teenage girl struggling with the loss of her mum and the emotional loss of her father, whilst dealing with the isolating displacement of having to move house and start at a new school. 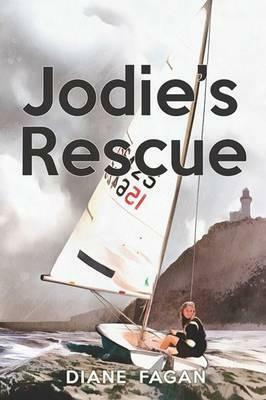 Feeling alone, helpless and misunderstood, Jodie finds solace in Sea Mist, her little sailing boat gifted to her by her grandfather. With Sea Mist, she revisits the places special to her mum and avoids the stark emptiness in her life. When Jodie meets Sarah, the daughter of her dad’s client and a classmate at her new school, she starts to feel connected to the world again. Like Jodie, Sarah struggles, dealing with the suffocation that comes from overprotective parents, who expect way too much, whilst having her very identity trashed on a daily basis through racist bullying. Through each other they discover acceptance and friendship, as they try to wade their way through life’s murky confusion. What I liked most about Jodie’s Rescue by Diane Fagan, was the emotional journey it took me on. Each character has a deep personal struggle they are trying to understand and overcome and through those struggles the stories evolve and relationships are formed. An engaging read for primary school girls aged 8 years and up.